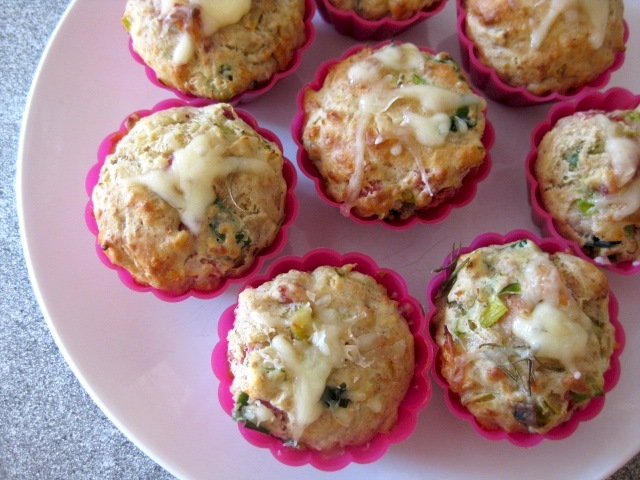 Savory muffins are just as easy to make as sweet ones. There might be more ingredients to add to the savory ones, therefore less flour is typically used. There are so many variations as to the filling you can use – any type of deli meat (ham, bacon, etc. ), cheese (neutral like swiss but more flavorful can be used, such as parmesan, gruyere..), vegetables (zucchini, carrots, beans, peas, cauliflower, broccoli and much more), herbs (spring onions, thyme, rosemary..) and spices (nutmeg, allspice, black pepper, etc.). Preheat oven to 200C/390F. Line muffin tin with paper cups. Grate cheese. Cook bacon in a pan without oil/fat, remove from pan and set aside to cool. Chop salami into tiny squares. Chop leek and cook reusing the fat released from the bacon in the same pan. If not enough, add some oil, stir and cover with a lid. Cook until softened but still green. Sprinkle with sea salt and let cool in pan uncovered. In a large bowl, beat eggs manually, pour in oil, yogurt, milk, mustard and spices, and stir until well blended. Sift white flour, baking powder and soda into the wet ingredients mixture. Add course flour separately, unsifted. Stir until a homogenous mix has formed. 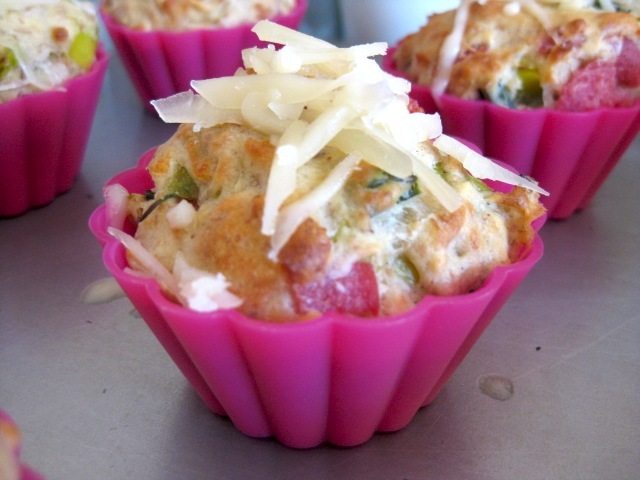 Add filling ingredients – leek, bacon, salami and cheese. Reserve 1/2 cup of cheese for sprinkling on top. Pour batter into paper cups. The recommended amount is 2/3 of the cup but I fill mine to the top so a nice hilly top forms. For smaller muffins, follow the 2/3 rule. Bake in oven for 10-15 minutes or until golden brown and done in the center (insert a wooden toothpick to test if the touch test doesn’t work). Sprinkle with cheese 5 mins before they’re done and return to oven. Let cool and serve still warm.